When I think of plum sauce, my mind immediately goes to Asian cuisine. A delicious, viscous sauce with sweetness and umami to enhance many dishes. So imagine my surprise to find pork in plum sauce on the menu at the first restaurant we dined in our first jet-lagged evening in Florence. My husband, who loves all things sweet, tangy and pork, made this is choice. The dish arrived and it was not what we expected. Perfectly cooked pieces of pork tenderloin (no doubt raised on the heady grassland of the Tuscan hillsides) gently cloaked with a light sauce of re-hydrated prunes to deglaze the pan. This was complemented by the subtle aromatic flavor of fresh bay leaves, something i had forgotten and came to embrace during our journey. The sauce was not sweet and had a mellowed flavor from the prunes. A whole lotta umami and nothing I would have expected from my knowledge of Italian cuisine. But that’s just the point. We know cultural cuisines in thin slices, stereotyped and collated to a few dishes that we then apply to whole countries. The real cuisine of any place is local, distinct and amazingly diverse. Villages and towns all around the world have signature dishes. Parma is known for its ham and cheese, Modena for balsamic vinegar and Alba for it’s truffles. Travel books about Tuscany mention the bistecca Florentine and tripe as signature regional dishes, which they are. What they should also mention is the delicate, subtle ways that food is flavored with herbs and that you should stop at a local restaurant and try something that may end up being a delicious unexpected journey. This pork dish was so delicious, I tried to recreate it. 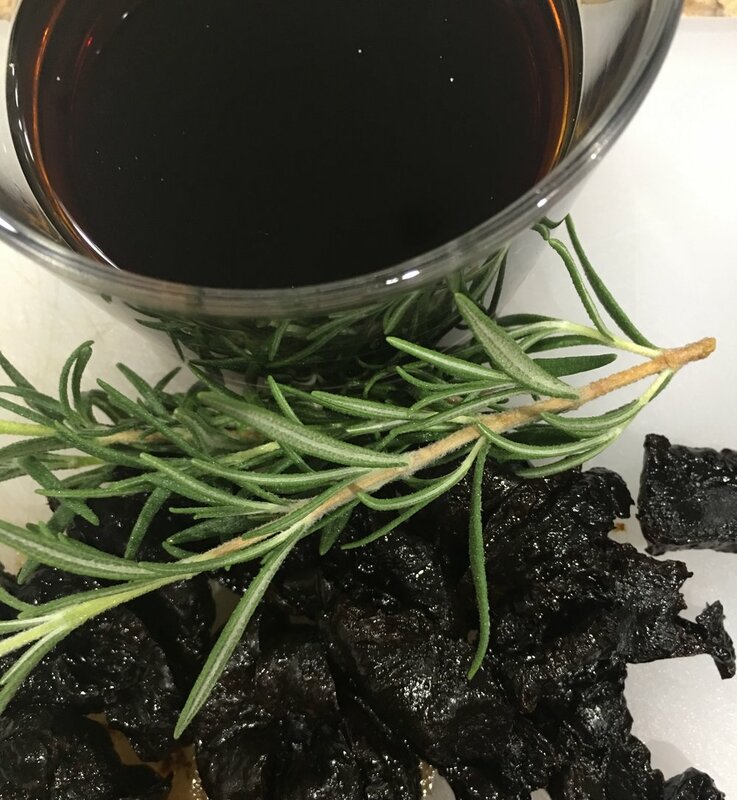 The trick was to mellow the sweetness of the dried prunes in rehydration. I chose to soak them in a little dry white wine, which did the trick, although I’m not at all sure this is the actual method. My version had a little more sauce and rosemary as the herb (I have since acquired a very small bay laurel plant and am tending to it with great affection) . I soaked the prunes for 10 hours as a consequence of the work day, but I think 1-2 hours will be sufficient unless you have very dry prunes. My husband loved it and has placed it in the list of ‘company dishes’, which those of you of a certain generation will understand. The only real preparation involves soaking the prunes. Otherwise, the dish comes together in little more time than it takes to pan sautée a few pork chops. 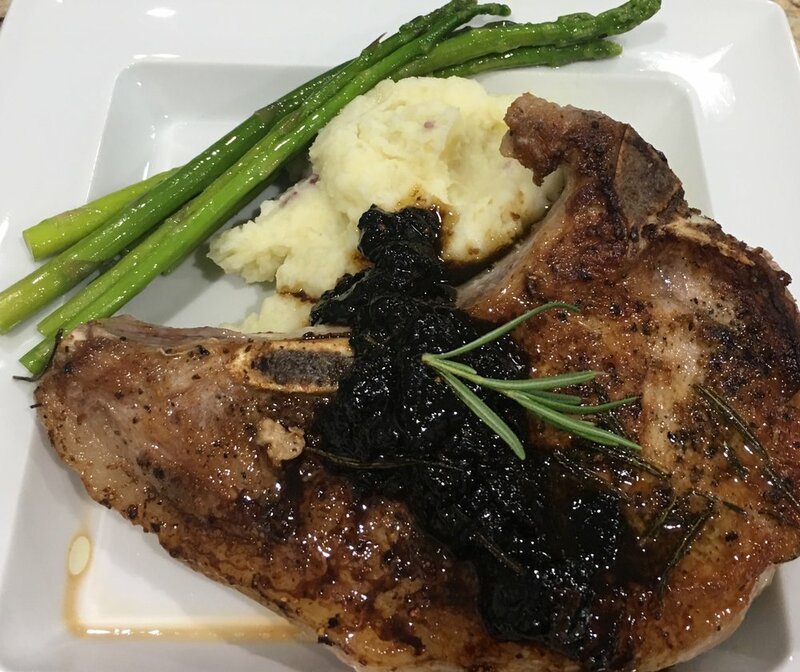 Remove pork chops from refrigerator and allow to come to room temperature (about an hour). Heat oil in heavy pan. Add the rosemary and brown the pork chop, then reduce temperature and cook through. Place on a plate and loosely cover to keep warm. Slice each prune in thirds. Add prunes and wine to the pan with the rosemary and deglaze. Simmer for 1-2 minutes. Remove the rosemary and add any juices collected from the resting pork chops, and simmer another minute. Serve the pork chops with the sauce spooned over.